Childhood is an important part of your child's learning and development. 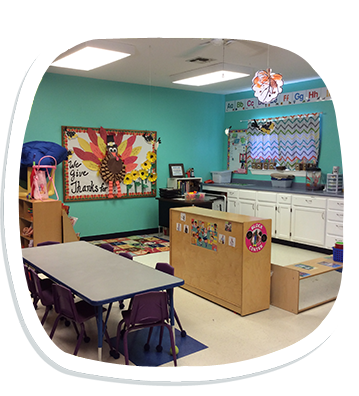 As your trusted partner in child care, Kid’s Academy in Buda, TX is here to assist you in providing guidance, attention, and care your children need during these formative years. Enroll your children in our child care center today! We offer superior child care programs that cover children’s basic early childhood education needs. We pledge to make the world a better place for young children and to love every child in our care. We pledge to educate children in all four areas of development: physical, social, emotional, and intellectual; and to build a solid reputation in the community for doing all the above. We believe that each child is unique and special with the potential to grow and learn. Our developmentally appropriate environment is designed to provide learning opportunities that encourage curiosity, creativity, and spontaneity. These experiences are extended and enhanced through the guidance of our staff. As child care professionals, we understand the importance of the early, formative years of childhood. The valuable experiences and opportunities for first-time achievements that are presented to young children lay the foundation for higher learning. It is our objective to create a happy, warm, and disciplined environment for our students. Therefore, we will strive to teach manners, fairness, courtesy, and respect for others, while remaining constantly alert to the well-being of our students. Quality child care is now within your reach! Partner with Kid’s Academy for your children’s learning and development needs. Browse through our website today to learn more about our child care center and the services and programs we offer.